Another great series from Big Finish comes to an end with a bang! This is a great opener to the set. Sometimes I find myself left a little cold when they do reset episodes at the beginning of a new set as opposed to continuing the story from the last one. But in Ship in a Bottle the reason why we are slowing the story down relates to the cliffhanger from the story before. The Doctor (Paul McGann), Liv (Nicola Walker) and Helen (Hattie Morahan) are in the Empty future they have been sent to by the Eleven. This gives us the perfect opportunity to reflect on what has happened, on the fact that they have lost big; seemingly forever and it shows how they all cope differently with the unwinnable situation. Will they fight the dying of the light, or accept their fate? It’s the perfect background for these three stunningly good actors to play off each other and gives us a great bottle episode. Whilst the Doctor and Co are stuck in a dead future, River Song (Alex Kingston) is working her side of the problem in the here and now of Gallifrey. Which is a sort of home coming for her to a home she never knew. She starts to work immediately fooling Padrac (Robert Bathurst) by playing her reputation as a Doctor killer. In this Doctor-light episode Alex Kingston gets to shine even more than usual and Bathurst’s Padrac oozes with smarm and self-importance as usual. This is a little more action based than the first episode; but again feels like a real actors episode. Weeping Angels, The Monk (Rufus Hound) and a previous incarnation of Cardinal Ollistra (Carolyn Pickles). It really is a ‘shut up and take my money’ moment. This showcases what the Timelords who are against Padrac’s rule are doing and of course in their arrogance how they are getting it all wrong. They have trusted the Weeping Angels. Something the Doctor knows all too well you never do. It’s also thrilling to see the 8th Doctor meeting the Monk again. It’s in a different body, but this is still the man who saw his great grandson killed and although they never expressly mention that; it is very apparent in McGann’s performance how personal this is. The Doctor never liked the monk, but maybe previously his good nature may have given out the possibility of trusting he could change. Rufus Hound was born to play this incarnation of the Monk and as always drips with self-importance, self-worth above others and his want to have fun and the cost be damned. Pickles also lays down a great foundation of how Ollistra becomes the high council member we meet in the War Doctor series. It might seem I’m doing a disservice to Mark Bonnar by not yet mentioning his ever wonderful tour de force as the Eleven. I was saving it. He is amazing in this set from his first line to this gripping conclusion. To play someone so wild and mad but that still has such a clear intent of what he wants to do is genius. I don’t want to say to much about how this all ends; but it’s very satisfying. You feel like there is a conclusion, but it leads neatly into the up-coming Time War 8th Doctor series with a few loose ends needing tying up. Some are pardoned and some punished. The best thing about these stories is that since Dark Eyes the Time War has been foreshadowed and the closer you get to it, the closer you get to the day the Doctor loses so badly he can’t actually be the Doctor anymore. So the closer you get the harder it is to show the Doctor being the positive ‘I can win’ Doctor. This set plays that loss of certainty nicely without crossing the line that he doesn’t cross until that fateful night on Karn. 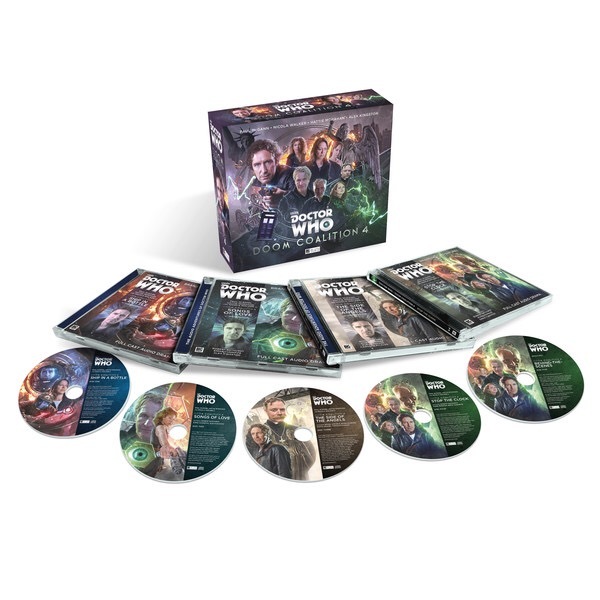 The writers, cast and everyone involved are on top form and have only made the job of the Time War set even more challenging. I give this a well-earned 11 out of the Eleven.